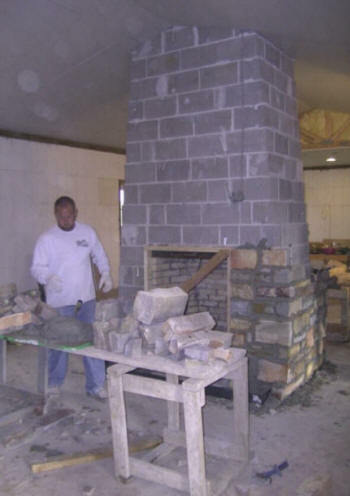 Local Block/Brick Mason Contractor 24x7 Local Block/Brick Mason Contractors masonry construction chimneys brick block-Repair Remodels Restoration Work New to historical Mason Brick Mason Masonry Repair. 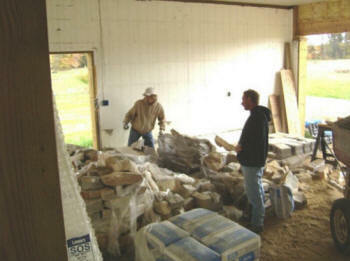 BRICK MASONS, BLOCK MASONS, STONE MASON BRICK BLOCK LAYERS MASONRY REPAIR FOUNDATIONS WALLS. BTW, did you know that mortar is available in different strengths? 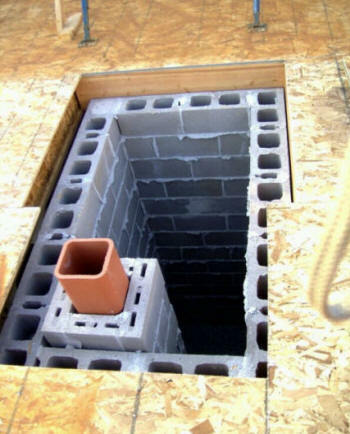 Type M is the strongest and is not generally used to lay bricks on vertical surfaces. 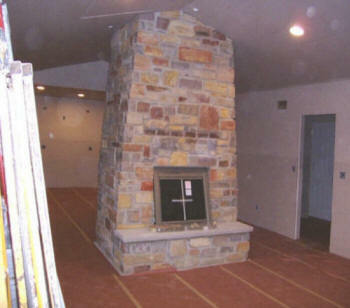 Type S is normally used for exterior brick veneer. Type N is generally used inside, particularly where freezing temperatures occur. Type O and Type K are seldom used any more but when they are, you may find them being used with old bricks since they allow some movement in the wall to help minimize cracking of softer brick. Bond A bond is the patterned arrangement of brick or stone in a wall. 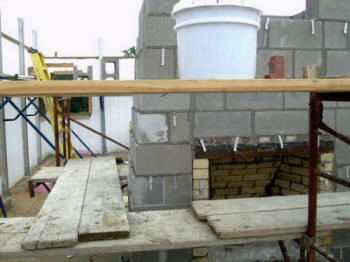 The brick must be lapped upon one another, to prevent vertical joints from falling over each other. 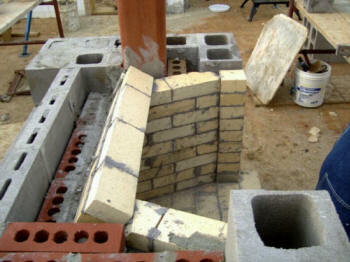 Mortar is a pasty building material composed of sand, lime and cement mixed with water. This mixture gradually hardens when exposed to the air. 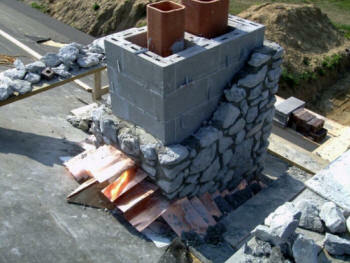 Mortar is used as a joining medium in brick and stone construction. 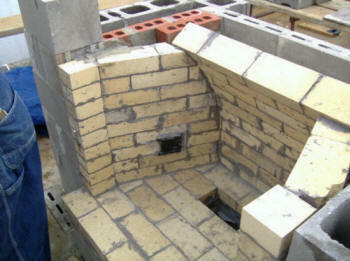 Joint A joint is the mortar bond placed between individual masonry units such as brick, block or stone. 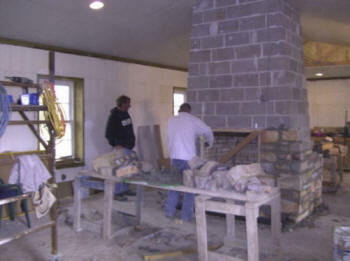 When a brick is laid down the mason must decide which side of the brick will face outside towards the viewer. Will the brick be set flat or will it stand up? Will the wide side or the narrow side face out? The following are terms which describe how the brick is set. Is it vertical or horizontal? Does it show the long or or the short side? Does it show the narrow or the wide side? Is it laid down on the narrow edge or the wide edge? Course Setting a course means to arrange in a row. A row of bricks, when laid in a wall, is called a course. 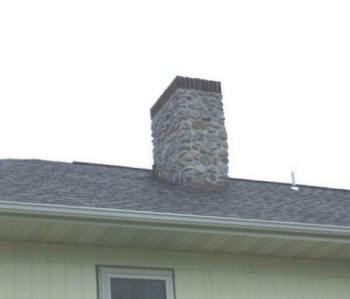 It is a continuous level range or row of brick or masonry throughout the face or faces of a building. 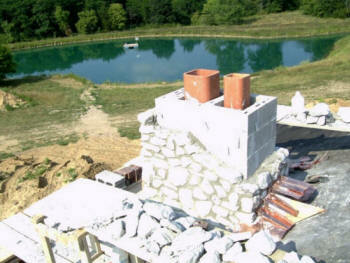 Each horizontal layer of brick in a masonry structure is called a course. Brick laid flat and perpendicular to the face of the wall are called headers. 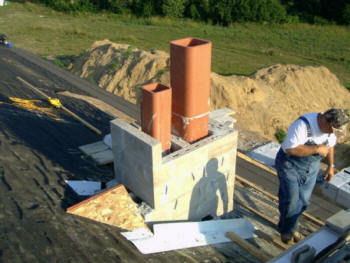 A header course consists entirely of headers (horizontal, short, narrow side laid on wide edge). Rowlock Occasionally a special type of course is used for either structural or decorative purposes. 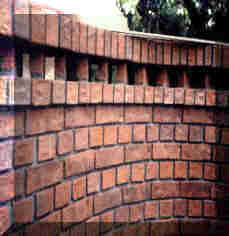 The rowlock or rolok is similar to the header course except that the brick are laid on narrow or face edge. This type of course is often used as the top course or cap of garden walls and as window and door sills (horizontal, short, narrow side laid on narrow edge). Stretcher Brick laid flat with the long face parallel to the wall are called a stretchers. When all the brick in the course are laid in this manner, it is called a stretcher course. (horizontal, long, narrow). Soldier A soldier course is one in which brick are laid standing on end with the narrow edge facing out. This type of course is sometimes used for decorative effects over door and window openings and in fireplace facings (vertical, long, narrow). Sailor A sailor course is similar to the soldier course but with the wide edge facing out. It is used for decorative effects (vertical, long, wide). 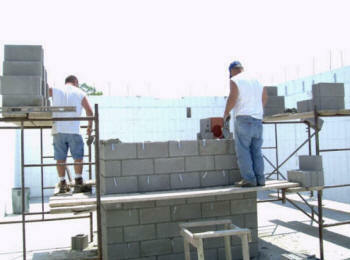 The width of a masonry structure can be measured by stretchers and joints. 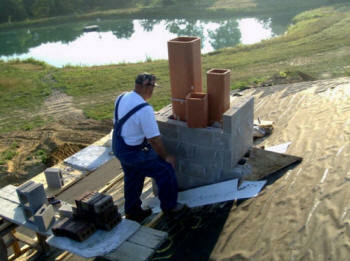 The height of a masonry structure can be measured by courses and joints. 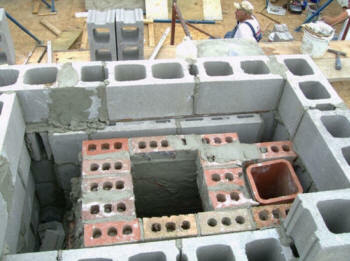 Alteration of masonry concrete block walls. Filling in of existing doorways, and creating new doorways, that were presumed to difficult and uneconomical to complete. Containment walls, elevator shafts in existing buildings, new construction and all types of brick, block stucco, and veneers. 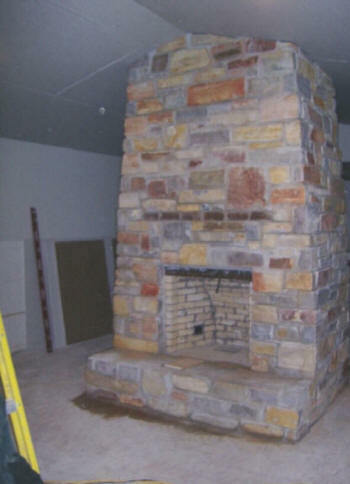 We provide Brick Repair, masonry repair, mortar joint repair, spalling brick repair and replacement, brick crack repair, brick re-pointing, and other masonry wall repair services. Excavation of soil to receive new footings. We supply our own equipment for the convenience to our customers for one stop shopping to help eliminate confusion. Masonry Contractor, Mason, Concrete Services, Brick Layers, Brickwork, Foundations, Block Layers, Sidewalks, Driveways and Repointing. 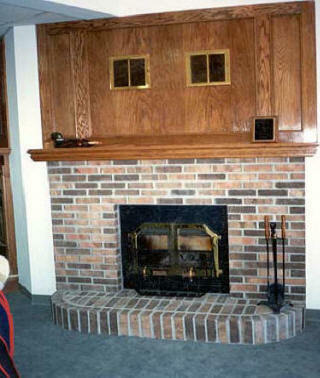 Our brick repair specialists provide a wide range of brick repair services. 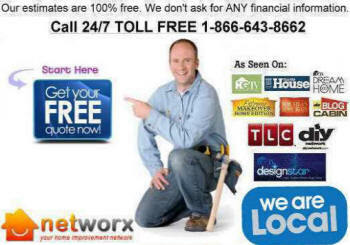 Among these are Brick and mortar repointing, broken brick replacement, brick arch repair, brick mailbox repair, chimney and fireplace repair, brick mortar matching, foundation settling crack repair, patio/retaining walls/planters repair, and other forms of brick mortar repair and tuckpointing. Brick Repair-Brick and Mortar Repointing bricks and mortar is commonly referred to as masonry repair/brick repair, or tuckpointing. Brick walls often require tuckpointing due to aging and weathering of the bricks and mortar and foundation settling and movement. 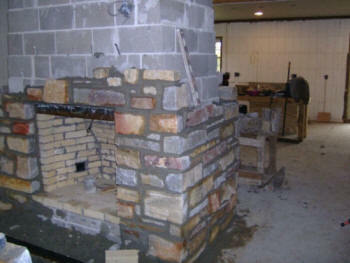 During the process of repair, the damaged bricks and mortar are removed and replaced. Many brick repair companies provide their own mortar color matching services, but this is not matching the mortar type or composition. 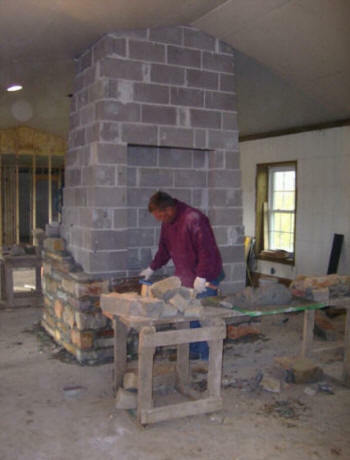 It is recommended to get mortar matching services from a testing lab to ensure a proper mortar mix for your repairs and tuckpointing of foundation settling cracks in your brick walls. 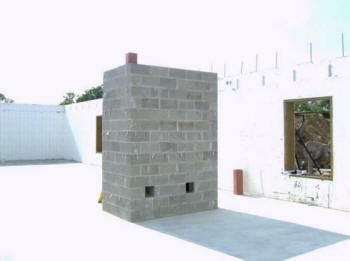 New construction of commercial and industrial sites specializing in reinforced concrete footings, walls and buildings. 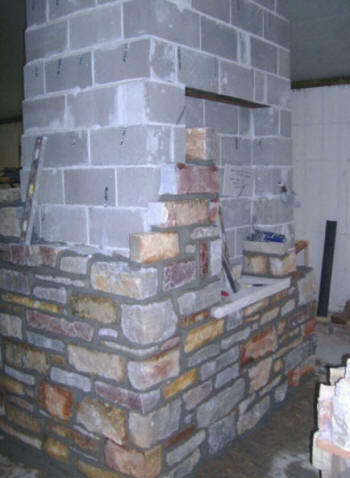 Masonry specilizes in custom masonry work and uses all the latest materials and methods for creating the finest brick work, foundations, retaining walls, concrete stairs, patios, driveways, sidewalks and more. We use the latest styles and designs of pavers and retaining wall bricks to create the finest in designs that will certainly add value and function to your property. 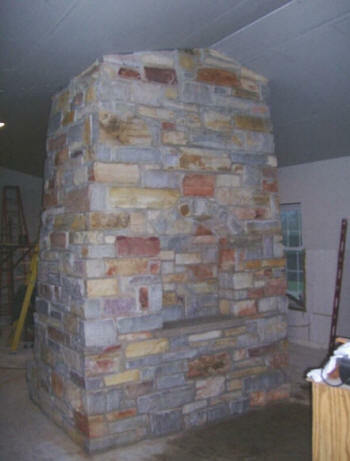 Find local Masonry Contractors, bricklayers, and stone masons to build masonry walls, brick and stone patios, waterfalls, retaining walls, concrete block walls, masonry steps, fix mortar cracks, build or rebuild brick and stone mailbox, fix or build masonry chimney and fireplace, and Brick Repair Services.